Buoyed up, as I was by the Free Plan in RCM&E for Andy Blackburn's Canberra, having read what an amazingly fast plane it is to fly, also being the owner of a Jet Provost, I thought, I must have a crack at this one, so, when Sarik released the wood pack, I ordered one which arrived in the post. 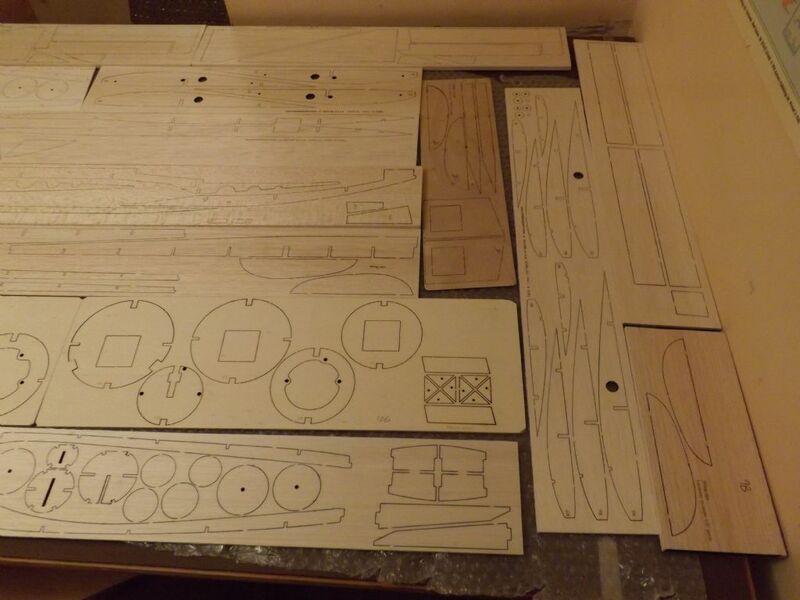 Having looked at the pack, I was amazed how much of the plan had found itself onto cut wood - even the servo tray and the supports, and the root template for the wing root rib. Very high quality and value for money. First job is to make the wing skins, as the wings are built up on them. One has to mark out the position of the ribs and the spars on them. Fortunately Andy has marked up the plan with the lines on the outside of the sheet. 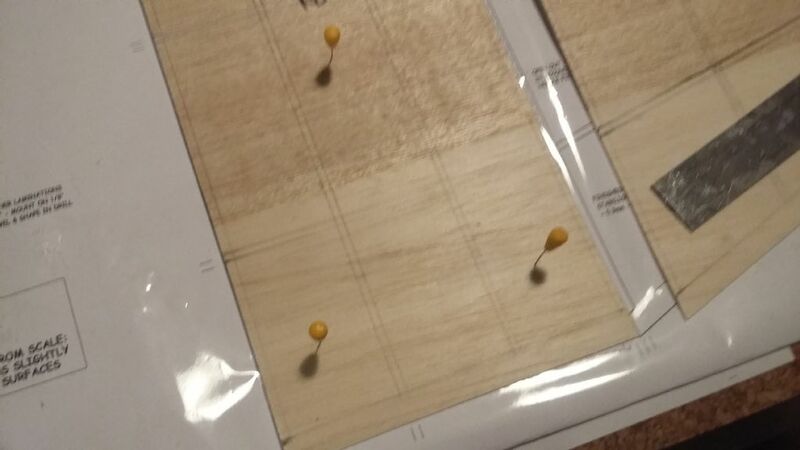 To make the sheets one lines up pieces of 4 inch 1.5mm balsa, masking tapes them at each end then one lies masking tape along the join to hold it together, then you seep Aliphatic Resin down the join and hold each sheet in position until it dries. Andy then says sand them down and smooth before you make up the wing as otherwise you will end up with peaks and valleys in the wood. I use florist clear film for wrapping flowers on a roll to cover the plan. I also had it copied at Mail Box so I have a spare to refer to. I find that the instructions you need are buried on the plan that you are building on so useful to have a copy. 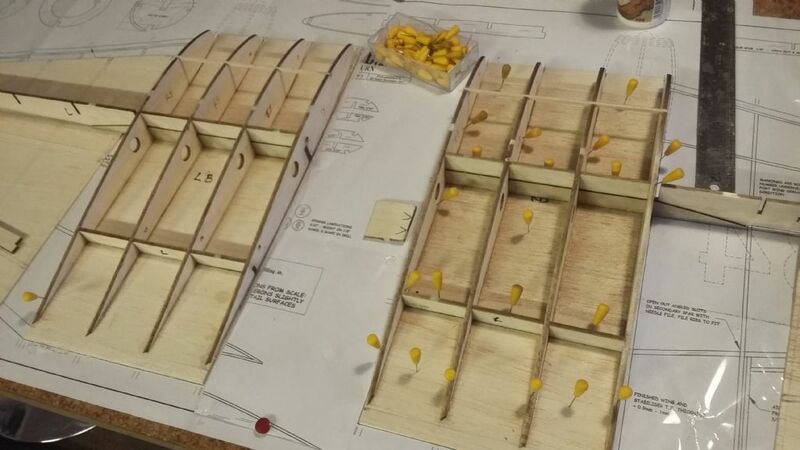 I cut both the inner and outer wing sheets in one piece the separated them as you build the inner wings first, flat on the board then undo them to put the outer lower spar flat on the board, and pivot up the inner wings. The outer panels are up on a dihedral. I'm doing all this of course whilst waiting for the Hurricane Mass Build. Hoping to get the wings finished before I change models. I am going to make both wings at once in the correct position to fit through the 3mm brass tubing for the wing pegs, and the carbon rod and tube for the centre joining rod. This should ensure that the wings line up with the fuselage correctly, for when the time comes. I've taken the plunge for this build as well. 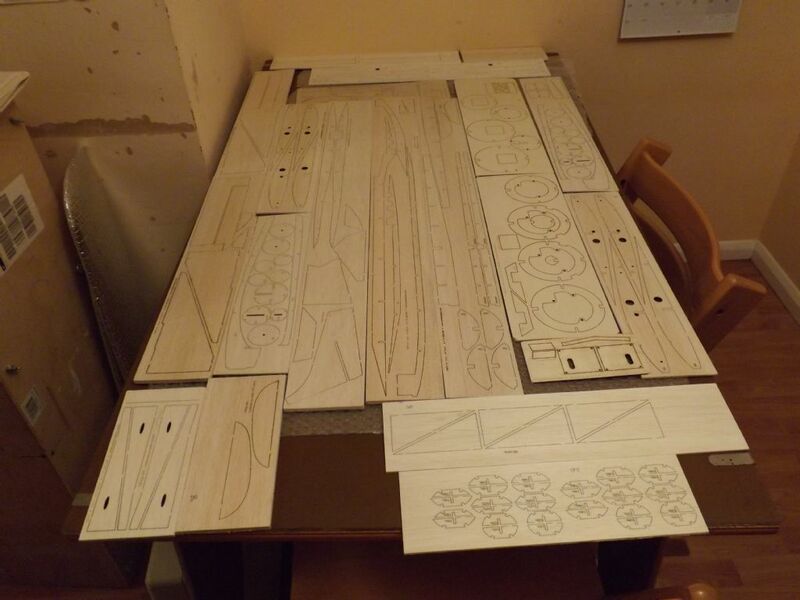 I normally fly full house gliders on the (Devon) slopes, but decided I wanted to build something scale in odd 15-minute slots in the evenings, which I might eventually fly (so don't hold your breath for a completed model). So, for a first foray into scale, this seemed ideal. Nice colour scheme. Will be watching with interest. Devon Slopes - why not start a blog? Andy - are you building as well, or do you just like being behind me? This blog may not last very long - depends on how soon the Hurricane appears. 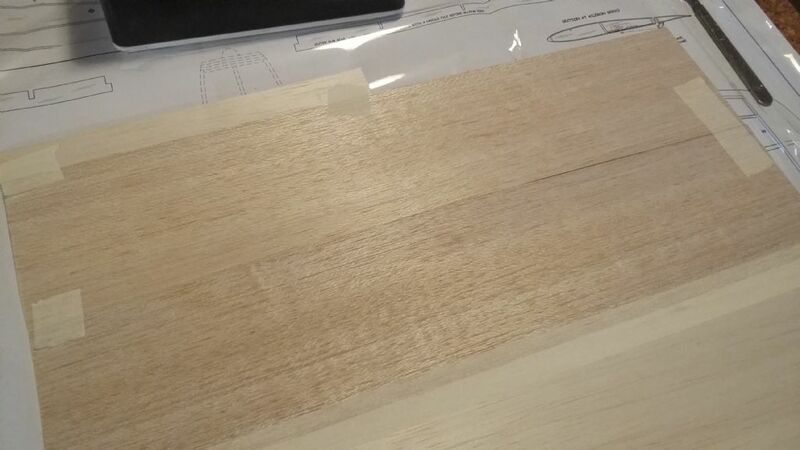 The other superb benefit of the woodpack is that every part is marked, so you know which part is which - something I am not used to, and helps a great deal. It's that attention to detail that impresses - good start for Sarik, because Traplet were not as good at marking. It bodes well for the Hurricane woodpack when it comes out. I have even been on the Internet to read all about the Canberra and its history - high flying bomber apparently - 70,000 feet - that's a long way up. Have forgotten most of it now of course, but interesting. Must buy that anorak. Couldn't work out what the Royal Aircraft Establishment was. Still, I am sure some kind soul will tell me in April at the meet in Llandudno. RAE is a research and development facility. My build will start some time this year Pete - might be at the end of the year, but we'll see. Finished for April? Well, why not? So I've started Another Andy Blackburn PSS Canberra thread. 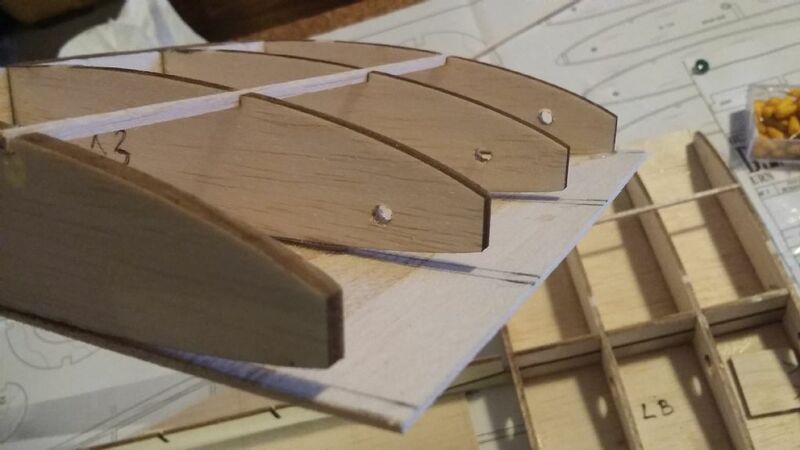 You should be able to do the fuselage with 4 sheets of medium-soft 1/8" x 4" x 36"
The fuselage will also need a bit of 1/4" x 1/2" for the hatch doubler and a bit of scrap 3/8" square for mounting the rudder servo. And some scrap bits of soft 1/4" and 3/8" sheet for the tail infill. 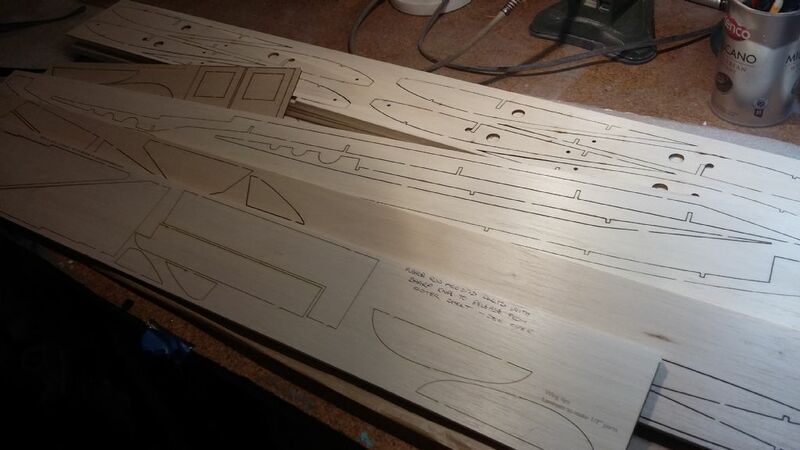 Wings are skinned with 16 sheets of medium 1/16" x 4" x 36"
Wing leading edge is hard 1/4", 2 lengths of 1/4" x 1/2" x 36"
Nacelles will should be do-able from 2 sheets of soft 3/32" x 4" x 36" and (I think) 2 sheets of soft 3/16" x 4" x 36"
1 x 3/8" x 3" x 36", weight 55-65 grams"
1 length of 1/4" x 1/8" Spruce - I bought some mahogany from the local shop of just 1/4 x 1/16" and will glue 2 strips together to make 1/8" as it is just for reinforcement of the fin and stabiliser. I got the canopy and bomb bay Perspex from Vortex as recommended, and have ordered a pilot from Real Model Pilots at 1/18 scale with an ejector seat. They still have the pilot Andy ordered on their system. I won't need the bomb aimers front canopy as I am not doing the same version, so if any one wants one pm me and I can send it to you. I have bought some red and white Solarfilm before stocks run out, because, as no doubt you have heard, they have closed down, and the owner has retired. Such a shame because now we will have to buy much more expensive product instead. 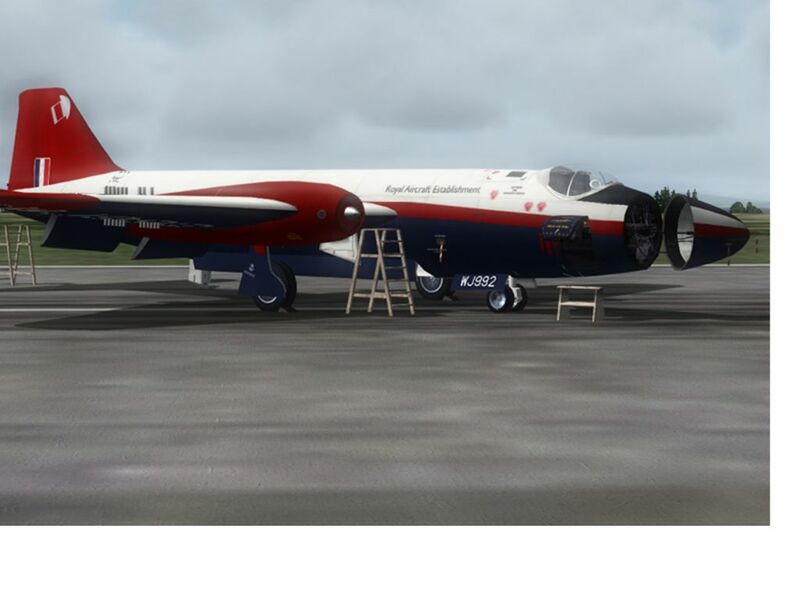 I already have some blue left over from my BAE Red Arrows Hawk - same colours. I haven't started yet because I am still waiting for carbon tube. 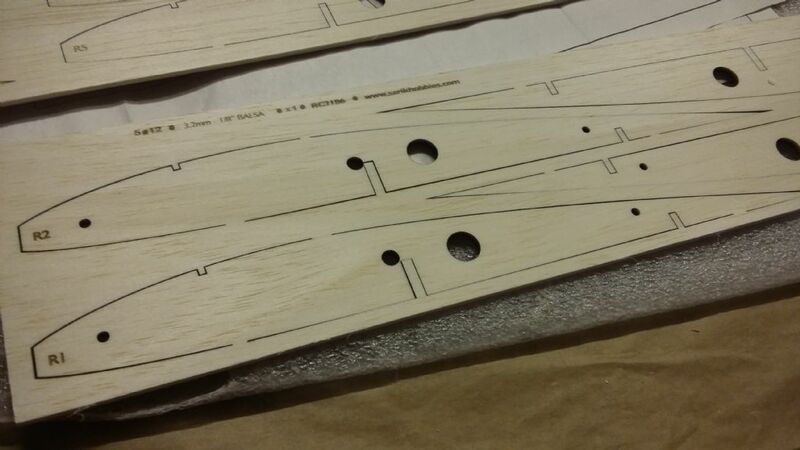 It will be a larger diameter than the tube diameter cut out on the ribs (7mm I think), and I want to drill out the holes before I assemble the inner wing. It will be a lot easier. Pete - no need to buy more expensive film. The Hobbyking film is far cheaper, and imho, superior to the Solarfilm offering. I've not used the Hobbyking film but I notice that Sussex Model Centre are selling Monokote - which I like - if anyone wants to do the grey/black scheme. I wish I'd glassed mine, on balance. Thanks Andy for the tip. It is always something that makes me very nervous, and cautious. The carbon tube and rod arrived. I am not altogether happy with the snug fit of the rod inside the tube, but it will do. The outer tube is bigger than the hole cut in the ribs. I was quite anxious about enlarging the hole accurately so can up with an idea of hand turning a 7mm drill with a dummy spar butted up against it. It seemed to work fine. The other alternative would have been a round file but it is almost impossible to get it exactly round, and the extra room needed was all on one side of the hole. -- or make one . Try giving the rod a few thin coats of epoxy finishing resin, flatting down between each coat with fine wet & dry. Excellent Mark thank you - didn't know they even existed. Well I put the inner wings together then zapped it with cryano - the fumes when hot superglue dries really make your eyes sting - not good for your lungs either, I'll be bound. 1 or 2 ribs snapped off at the rear spar when being pressed down but I glued them back together. You have to be very careful when pressing down to engage with the spar as they are a tight fit. 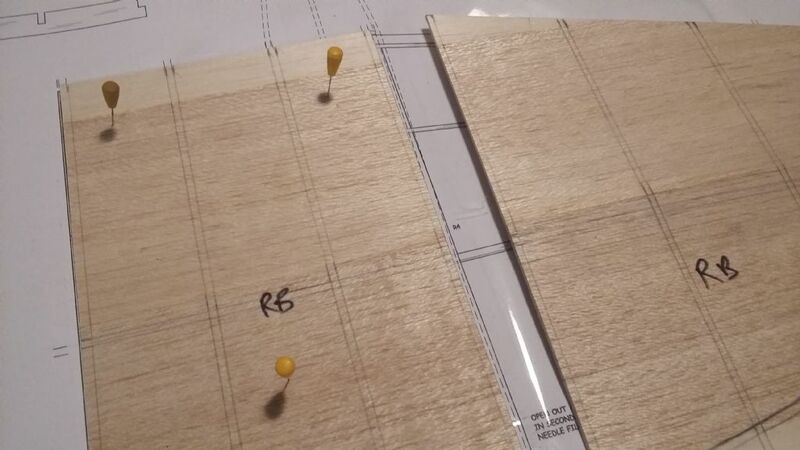 The plan shows a very thin root rib as well as R1, which I assumed was 1/64" ply - do you recommend that as the part doesn't appear anywhere - just the 1/16" ply root facing rib, which is glued to the fuselage of course. It would of course strengthen the face of the wing? Belt and braces if you like? 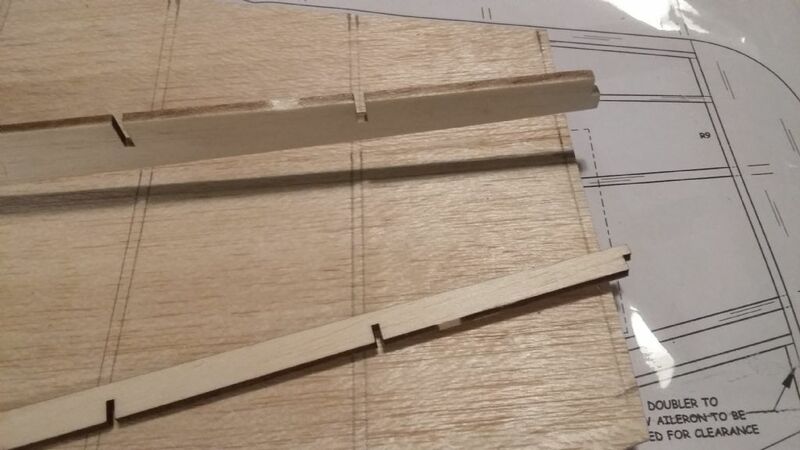 The photo in the article shows 2 pieces of 1/8" balsa supporting the brass incidence tubes top and bottom between ribs R1 and R2. There is nothing on the plan. Do you recommend that - obviously D1 to D5 are shown supporting the carbon middle tube but nothing other than the 1/8" end caps supporting the brass incidence tubes? 1. 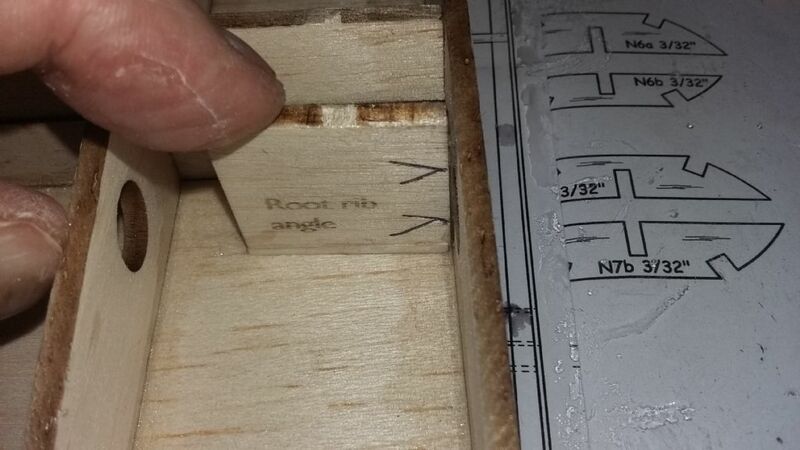 The very thin root rib is indeed 1/64" ply, it's not in the wood pack as the stuff is about £300.00 per square foot but if you have some lying around it will stop the wing root looking a bit tatty over time - just draw around the wing root, add some appropriate holes any old how and carefully sand it to the wing profile. If only some clot hadn't forgotten to add a note to the plan... 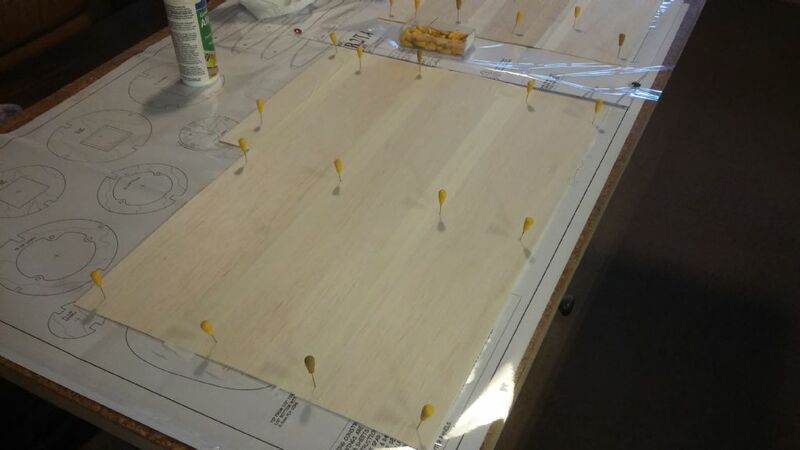 If you haven't got any 1/64"ply, a thick coat or two of epoxy finishing resin will do, flatting with a sanding block between coats. 2. 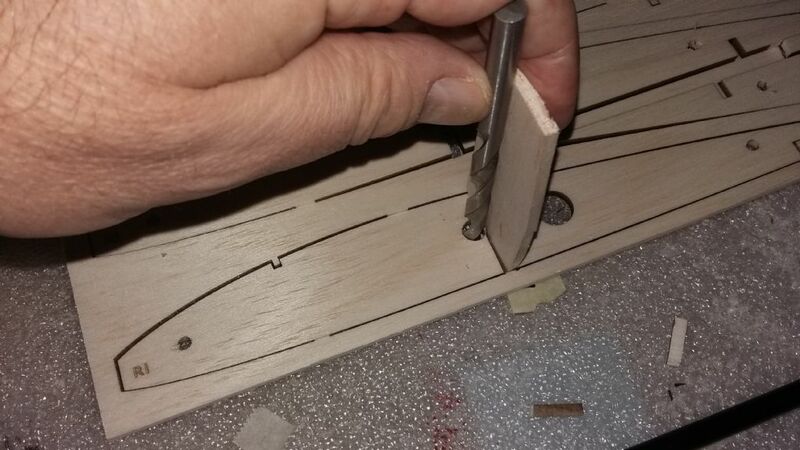 It's not strictly necessary to add some 1/8" balsa at the top and bottom of the brass incidence tubes, but if you can spare the balsa and the time (about 20 minutes) I'd recommend doing it because it will make the wing root more robust, and that's where your finger will usually hold it. Excellent Andy, perfect. Will really help. If I buy a kit, I usually reinforce the root rib in some way with either epoxy and micro balloons mix or ply as you suggest. I already made an executive decision to reinforce the incidence tubes as shown in the picture. 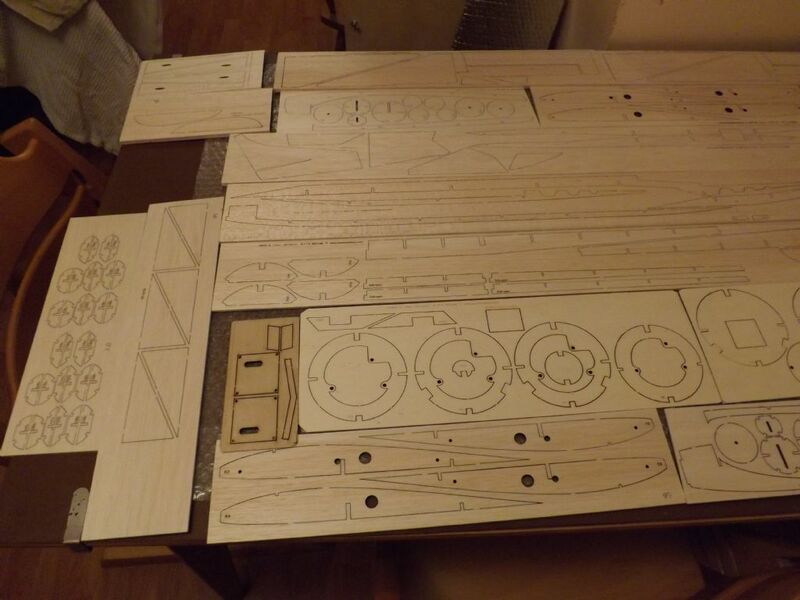 Sorry about this Andy, but I have to tell you that Sarik have not cut the main wing spar or the outer wing sub spar in accordance with the drawing of the parts on the plan. The slots for the 2 out ribs R8 and 9 are in the wrong place as you can see from the photo. 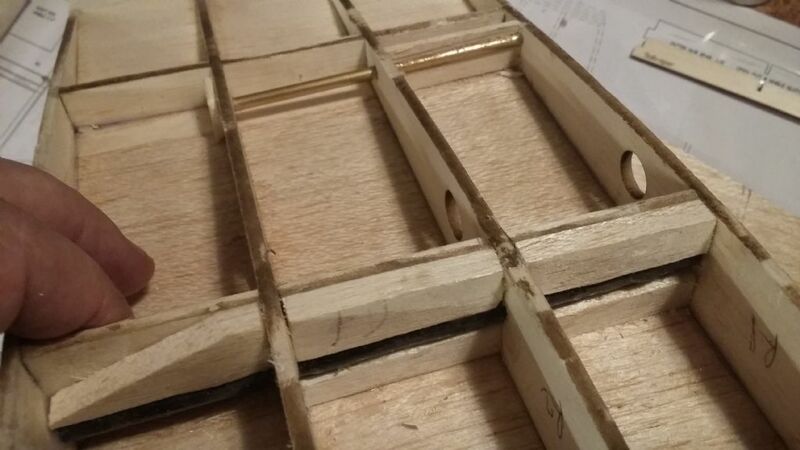 I will have to make new slots in the parts and fill in the gaps. OK, so bearing in mind previous discussions about trusting the parts and paper plans expanding and contracting with atmospheric conditions, either the plan or the parts could be at fault (although I suspect the plan, as previously discussed). I know the original parts were OK (see the original build thread) and Sarik have seen these, so they'd have to be going some to get it wrong, although it depends how they've managed the process and I can think of a couple of ways that errors might creep in.